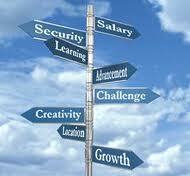 Don’t you envy those people who seem to be so clear about where they want to go in their careers? 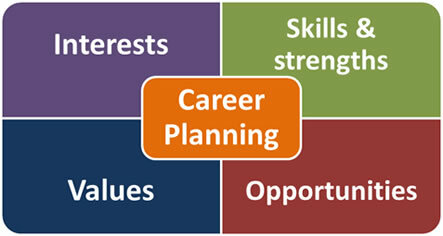 Career planning holds not even a grain of uncertainty for them – they seem to have this easy confidence that arises from clarity of purpose. However, many of us struggle when we’re asked to think of where we want to be in the next 3 – 5 years. What are our options we ask ourselves, and how do we sift through all of them – and that’s assuming that we can identify them? So what exactly are the sorts of things that should be considered when you start thinking ahead and determining which way you want to move forward with your career? OK. Some of the central questions to ask yourself, that would likely offer insights and guidance to help with your career planning…. What are my interests – the things that get me feeling enthusiastic and motivated and that I enjoy doing? What are the skills and strengths that I possess? What are my values and priorities – for example, am I placing more emphasis upon seeking more money, or maintaining some work-life balance? What are opportunities in the marketplace – both current and emerging – for people with my skills and experience? By investing some time and thought in career planning, it will be more likely that you end up performing the type of work that you find rewarding and gives you the type of satisfaction that you seek. However, career planning requires that you accept responsibility for determining what you want to do in the future….. and then start to plan how you can acquire the type of experience and qualifications that may be needed to help you achieve your career goals over time. By being willing to try new things as a means of broadening your experience, and investing in carefully selected training to develop your skills, you can sensibly position yourself to take advantage of opportunities that can arise in the future. In the following short video clip, Jack Canfield (personal development author and speaker) offers some great advice on career planning ..